FROM THE US OPEN – Serena Williams is pretty locked in now. Over the past 10 days, she has been focused and moving well. She is concentrating, and her big serve and returns are very sharp. She has had some errors, here and there, over the first four matches. When she had to play extremely well, she has. That’s why she has won 23 Grand Slams. Serena focuses, takes a long, deep breath, and then raises it up, and punches until she knocks them down. Anastasija Sevastova is having a blast, when she is in to it. She mixes it up, all the time, everywhere, especially her with her amazing drop shot. She might have the best one in the field. She can run, and she has a lot of creativity. She did upend Sloane Stephens, but the American was pretty ill. Still, Sevastova played a fine match. Can she out-hit Serena, or really bother her? Possibly, yes, if she is on track and she can confuse her, but Serena will knock on her early and win in two simple sets. 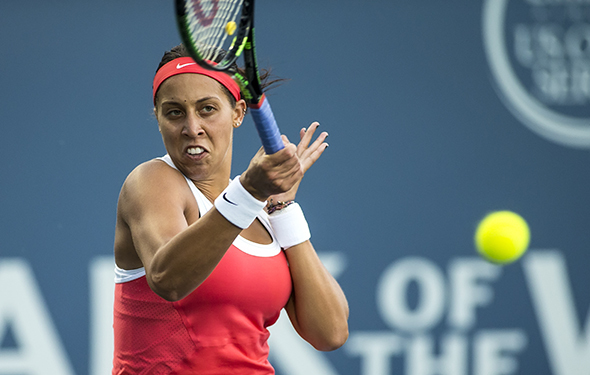 Well, well, look at Madison Keys, who was up and down all year, but now, she is being assertive and thoughtful. That’s why last year at the USO, Keys reached the final, beating Elina Svitolina, Kaia Kanepi and Coco Vandeweghe, before she became super nervous and she was crushed by Sloane Stephens. But, this time around, she should be calmer. The 23-year-old Keys has been doing it again over the past 10 days. Her huge first serve, as well as her forehand and backhand have all been reliable weapons. The same thing goes with Naomi Osaka, who is so forceful. The 20-year -old can hit her first serve around 115 mph, and she can bomb her flat forehand and backhand. Yes, all players can spin it, but still, when she want to pull off a winner, she can flat it out and smoke it. Keys and Osaka have played each other twice. Two years ago here, in the third round, Keys edged her 7-5 4-6 7-6(3). In 2017 at Indian Wells, Keys won in straight sets. However, Osaka has become much better. This year, she won the title Indian Wells title. Is this a tossup? No, not yet. While I realize that Keys was hurt a lot this year and she was struggling mentally, right now, she is healthy and driven. Without a doubt, there will be many short, hard rallies. At the end of the third set, Keys will win, happy that she will go to the final once again.